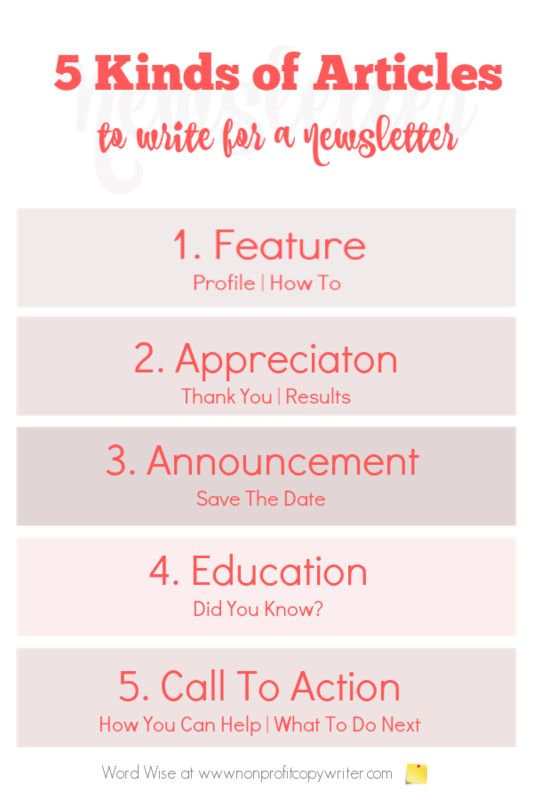 What kinds of articles should you include in your newsletter? A newsletter is written to an “in-house” audience and addresses a specific topic. That’s a whole lot different than newspaper articles, which are written for a larger, more general audience. Knowing the difference has distinct advantages. As a staff writer or freelancer, you’ll be called upon to write newsletters to help cultivate readers and build a relationship with them. You write newsletter articles specifically to this pre-qualified set of readers – those who have already expressed an interest in you by purchasing a product, making an inquiry, opting in, or expressing support for you in some way – landing them on your in-house list. I wish I’d known the distinction between writing newsletter articles and writing newspaper articles when I started freelancing. It would have helped to understand how to narrow down the kinds of articles to include in newsletters. My frustration has morphed into your gain. I've seen over and over that successful newsletters have 5 kinds of articles. Your goal is to cultivate your audience for your niche. Each of these types of articles achieves that goal in different ways. The success story article is part news article, part human interest, and part inspiration all rolled into one. It serves as the centerpiece of the issue. If you’re a nonprofit, write a success story of a beneficiary. If you’re a small business, use the success story slot for an appealing how-to or customer profile. A success story inspires or pulls at the heart because it reveals a changed life or gives information about how the reader’s life can be better. Like a feature article or case study, a success story reports who, what, where, and when … but goes further. Make sure your success story shows a problem and what led to change. Let your reader see pain, failure, stress – and achievement, victory, and solutions. Power Tip: Include a photo whenever possible. Publish a testimony. Get permission to print a letter of support from a partner or beneficiary. Share results. For instance, perhaps your food pantry provided 532 bags of groceries to 389 families last month. Or announce that your annual report is available and publish an excerpt that shows a specific achievement. Spotlight your supporters. List new sponsors, volunteers, and donors. Publish a regular “Volunteer Spotlight” column. Say “thank you” in an article, open letter, or with a special bonus offer. Share with your readers upcoming events, campaigns, new programs, sales, special offers. Give links so readers can participate. Power Tip: Be sure to specify deadlines. 4. Education Article: Did You Know? The “Did You Know” section is your opportunity to educate your readers about your niche in a fun and engaging way, even if they don’t know you’re doing so. Here’s where you offer news articles, insider tips, industry information, reviews, facts, data and statistics, staff and board changes, or even a post round up from other industry contributors. Power Tip: link an issue’s “Did You Know” content to the success story. For example, if your feature profiles the impact of your new well in a small African community, then share a short “Did You Know” article (maybe even in a sidebar) about the number of villages without a well in that country. This way, you reinforce the need and show results at the same time. Always offer an opportunity for readers to engage with you. Invite them to attend an upcoming event, volunteer, become sponsors, use a coupon, participate in a giveaway, share your content on social media, offer a comment. Power Tip: In each issue, suggest at least three different ways readers can take action and respond in a How You Can Help article and in calls to action in other articles throughout the newsletter. Three types of newsletters: which is right for you? What's a listicle and how do I write one that sticks?